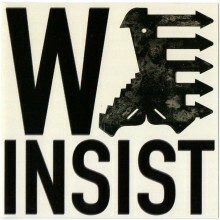 WE INSIST! 5 Tracks (1998) - We Insist! We Insist! After three years of working together and several demos, We Insist! released its first EP, recorded at Cargo Studio in September 1998, bringing to an end the early period of experimentation in jazz, R&B and funk. This 5-track recording reveals the more alternative direction We Insist! are to later explore with its unusual rhythmic patterns, powerful riffs and heavy saxophone lines.